He came, he sang, he conquered. Sceptics might have argued that none of these things were foregone conclusions: Jonas Kaufmann’s debut as Verdi’s ‘lion of Venice’ at Covent Garden last summer was one of the most eagerly anticipated operatic performances in years, but how he would fare in one of the most taxing roles in the repertoire after a period of vocal ill-health was the subject of much pre-match speculation. In the event, he was little short of magnificent. 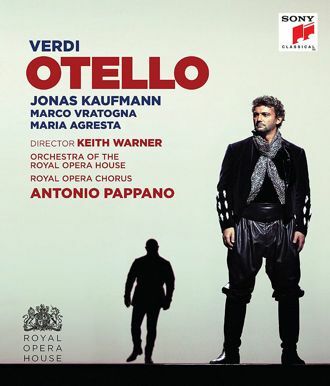 Kaufmann has come to redefine pretty much every role he touches, and this is no exception: his Otello is no elder statesman in the tradition of Vickers or Domingo, but a youthful firebrand who’s ascended the military hierarchy at lightning speed and still can’t quite believe he’s got there. In the early stages, the dormant psychological damage which renders him so vulnerable to Iago’s machinations is hinted at only obliquely: there’s none of the explicit manifestations of PTSD which we saw in his Lohengrin for Richard Jones, but rather a nervous energy that only dissipates in the arms of Maria Agresta’s maternal Desdemona (their Act One love-duet brings some of his finest singing of the evening as those trademark pianissimo high notes shimmer in the Cypriot night air). I was lucky enough to attend one of the live performances, but I appreciated both Keith Warner’s production and the subtleties of its central performance even more on-screen, not least because of the sensitive, illuminating camerawork masterminded by video-director Jonathan Haswell. Kaufmann thrives under the scrutiny of the camera, and for the first minute of the great monologue ‘Dio, me potevi’ it’s trained unflinchingly on his face, catching every flicker between self-pity, anger and numb disbelief; vocally, too, some of the fine-grained detail which got slightly lost in the opera-house really makes its mark here. His first appearance, though, is a straight-up coup de theatre: seconds before the famous ‘Esultate!’ rings out, the conquering hero rises up through the expectant crowd on a pedestal and Bruno Poet’s lighting (an unsung star of the production) hits Kaufmann’s famously striking features like a scene from Caravaggio. He has a formidable antagonist in the Italian baritone Marco Vratogna, who replaced Ludovic Tézier as Iago just three weeks before opening night. Shaven-headed, muscular and bullish, this malign ensign is a cards-on-the-table thug whose overt shadiness works as an elaborate double-bluff: rather than the oleaginous duplicity of a James Morris or a Leo Nucci, Vratogna’s apparent honesty is dressed up as a dysfunctional bluntness that borders on the psychopathic. His sadistic tendencies are firmly established from the outset, as he desecrates the severed head of an ‘orgoglio musolmano’ to the disgust of the massed onlookers (shades of Tolomeo in Handel’s Giulio Cesare here). Small wonder that this Iago didn’t get his promotion. Maria Agresta’s radiant Desdemona is no ingénue but a mature and assured First Lady who seems to be attuned to the volatility of the man she married but fatally overestimates her ability to diffuse it. Her impassioned but flawlessly-sung Ave Maria is an agonised dark night of the soul rather than an oasis of calm before the storm, and all the more affecting for that. Among the smaller roles, Frédéric Antoun brings Errol Flynn-ish glamour and elegance of line to Cassio - one easily understands how even this particular Otello could regard him as a credible love-rival. Keith Warner’s straightforward and relatively minimalist production (loosely Renaissance costuming shot through with a distinct modern accent, especially in the shattering final act) plays up the work’s claustrophobia and its preoccupation with contrasts between light and darkness; Moorish lattice-screens cast fragmented shadows over much of the action, particularly as Otello’s perception of reality begins to shatter in the middle two acts, and shifting scenery is used to great effect as first Cassio and later Otello are literally destabilised by Iago’s puppet-mastery.